This article is about the quest. For the place, see Bleak Falls Barrow (place). Start the quest The Golden Claw. Retrieve the Dragonstone from Bleak Falls Barrow. During the final stages of the quest Before the Storm, you will be tasked with a trip from Riverwood to Whiterun to tell Jarl Balgruuf about what happened in Helgen. Make your way to the Dragonsreach palace, where you will be stopped by the housecarl Irileth, who will demand a good reason to interrupt the jarl. You can either tell her about the dragon or report that Riverwood calls for the jarl's aid, both of which will grant you an immediate audience. Deliver the news to Balgruuf, who will order troops to be sent to Riverwood at once and then present you with a reward. He will then remember a job suitable for an adventurer such as yourself and lead you to the court wizard Farengar Secret-Fire, who has been researching dragons. Farengar wants you to fetch the unique Dragonstone from Bleak Falls Barrow, an ancient Nordic tomb near Riverwood. When you question him on what he knows about the quest, he will keep his information sources secret. Note: If you already cleared Bleak Falls Barrow and retrieved the Dragonstone during the quest The Golden Claw, Farengar will prompt you to hand it over immediately and complete the quest. See the notes section for what you may have missed. Either use ranged attacks on them from afar, battle them up-close and personally, or sneak around them and search the area for loot, including the contents of a locked chest. Proceed through the empty tunnels until you arrive in a puzzle room where another bandit is attempting to pull a handle. You can attack him yourself, or allow him to be killed by darts that he accidentally triggers. To avoid the same fate, look around the room and towards the upper level to see the correct combination for the movable pillars. Two symbols are up on the ledge above, while the middle one has fallen to the ground level next to the lever. They should be read from left to right, using the one on the ground as the middle symbol, in order to find the combination: Snake—Snake—Whale. Activate the movable pillars to position them. You can now pull the handle without being killed. The iron gate will swing open, allowing access to a room with a soul gem, a potion, a chest, and a copy of the Pickpocket skill book Thief. Locate the spiral staircase, head underground, and beware of a few skeevers lurking on the steps. "Get it away from me. Get it away!" Arvel: "You did it. You killed it. Now cut me down before anything else shows up." Player: "Where's the golden claw?" Arvel: "Yes, the claw. I know how it works. The claw, the markings, the door in the Hall of Stories. I know how they all fit together! Help me down, and I'll show you. You won't believe the power the Nords have hidden there." 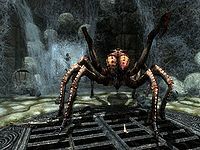 Attack the webs surrounding Arvel and he will be free; unfortunately, he will also betray you and take off running deeper into Bleak Falls Barrow. You can either give chase or let him run, as he is too weak to survive the upcoming draugr-infested catacombs. Run past two rooms and gather a small amount of loot along the way, including a soul gem. When the dead start to rise, dispose of them and beware the pressure plate and the corresponding spike wall. Be on the lookout for Arvel the Swift, who will likely fall prey to either the spiked wall or the following leveled draugr enemy. When you find his body, loot the golden claw and, for a bit of help on how to solve upcoming puzzles in the barrow, his journal. When you claim the claw, you will receive a quest update for the corresponding quest, and will be told to discover the 'secret of Bleak Falls Barrow'. Proceed forward and kill the three draugr in the next room. To the right of the swinging blades is a short staircase that ends in rubble. There is a chest containing minor loot at the top of the stairs. Dodge the swinging blades in the eastern tunnel. In the catacombs ahead, use the oil slick on the floor to your advantage or kill the attacking draugr normally. Follow the path until you arrive in a large chamber with a waterfall and one more draugr enemy. Activate the chain, head downstream along the underground creek, and beware the long fall where the creek turns into a waterfall through a hole in the eastern wall. If you search this area, you will find a pick and can learn how to mine ore. There is minor loot in the area and plants/mushrooms to gather. By the waterfall and entrance to the narrow tunnel, there is a chest to loot. Take the narrow tunnel leading south. You will emerge on a bridge halfway down the waterfall for a fight against another draugr (note that if you are a higher level you may find a frost troll instead of a draugr). Head all the way down to the bottom for some minor loot in a locked chest, then return to the bridge and head north. The final room is protected by a leveled draugr. Upon its defeat, head through the door to Bleak Falls Sanctum. In the beginning, the Sanctum is rather quiet with a set of swinging blades as the only obstacle. The next room, however, sees three draugr enemies and another helpful oil slick, if needed. Climb the wooden structure and proceed over the bridge to open the iron door. You will now face a puzzle door with three rotating rings. Following Arvel's advice from his journal, take a closer look at the golden claw in your inventory for the right combination. Rotate the rings to achieve the combination of Bear—Moth—Owl, then place the claw in the keyhole and watch as the door lowers. It opens to a huge chamber, complete with waterfalls, bats, and a word wall. Before entering the area with the wall, investigate behind it for a hidden, locked chest. Take a look opposite the word wall for a suspicious-looking sarcophagus and a chest with a good number of valuable items. Approach the word wall to learn the secret of the barrow, a word for the Unrelenting Force shout. After learning the word, the sarcophagus will burst open and a boss-level draugr overlord will step out and attack. Fight him and then examine his corpse for the Dragonstone, the item requested by Farengar Secret-Fire. Before leaving, look to the south; behind the smaller waterfall is another chest. Finally, climb up the stairs and activate the handle, which will elevate the stone wall and bring you to an alternative exit from Bleak Falls Barrow. In his quarters inside Dragonsreach, provided you started this quest before clearing out Bleak Falls Barrow (see notes), Farengar Secret-Fire will be accompanied by Delphine, the innkeeper from the Sleeping Giant Inn in Riverwood. She is obviously his 'reliable source', as the conversation reveals quite an extensive knowledge about the dragon situation. If you manage to race ahead of Arvel and clear the draugr, he will stop at the first swinging axe trap. If he spots you after the first draugr area, he will become hostile and attack you. 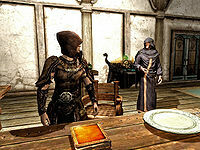 Farengar and Jarl Balgruuf's conversation will be limited to a short introduction as the jarl leaves right away. You will not get to experience Farengar and Delphine's conversation, and the book Holdings of Jarl Gjalund will never turn up on Farengar's desk. Farengar will be somewhat impressed by the fact that you already have the Dragonstone in your possession and give slightly different dialogue. After you hand in the Dragonstone, the Axe of Whiterun, a leveled axe with a random enchantment, is generated and placed in Jarl Balgruuf's inventory. Reloading will cause it to have a different enchantment. You may find that once you have killed the draugr boss, he does not register as a container, in which case you cannot retrieve the Dragonstone and therefore cannot complete the quest. Bethesda technical support recommends reverting to a save prior to you entering the dungeon, raising your level, and then returning to the Dragonstone quest. This problem occurs if you are hidden when reading the word on the wall. Reloading prior to reading this and letting the draugr spot you as he comes out solves the issue. Simply save on a new file after killing the draugr overlord and then load that save. The overlord will now be "lootable". You can use the resurrect command in the console and kill him again. Then you will be able to loot the Dragonstone from his corpse. Simply advancing the quest will also work by using the command setstage MQ103 180 which will then change the current objective to "Deliver the Dragonstone to Farengar". You can add the Dragonstone to your inventory via the console, but it will not be removed by Farengar later. You can advance the quest without it. If you cast a Fury spell on the wounded frostbite spider, it may attack Arvel, releasing him from the web. He will join you in fighting it, then stand there begging you to cut him down. Spells and weapons will pass through him. Destroying the spider webs will continue the dungeon as normal. The quest doesn't appear or activate. After completing the quest, Irileth may not come in and start Dragon Rising. 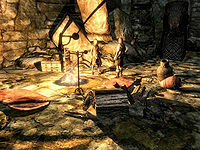 190 Finishes quest Farengar Secret-Fire, Jarl Balgruuf's court wizard, asked me to retrieve a Dragonstone from Bleak Falls Barrow, a stone tablet that he believes contains a map of ancient dragon burial sites. He hopes this will help him understand how and why dragons are returning to Tamriel. He was pleased when I returned with it, and promised that the Jarl will reward me for my efforts. The following empty quest stages were omitted from the table: 0, 1, 5, 8, 15, 20, 55, 60, 80, 90, 100, 182, 185, 200. On the PC, it is possible to use the console to advance through the quest by entering setstage MQ103 stage, where stage is the number of the stage you wish to complete. It is not possible to un-complete (i.e. go back) quest stages, but it is possible to clear all stages of the quest using resetquest MQ103.